Successfully Added GSM Remote Security Camera with Nightvision + Motion Detection to your Shopping Cart. This GSM remote security camera allows you to secretly on your home to see who is invading your private study or lurking around in your home office. With its innovative technological advantage of motion detection and night vision capability, you are assured of always being able to have a clear MMS image send to your cellphone, and receive alerts once the motion detection feature automatically activates. Once you've inserted a Dual Band SIM card into this GSM remote security camera, you are able to then call the inserted SIM number from anywhere in the world to on conversations. 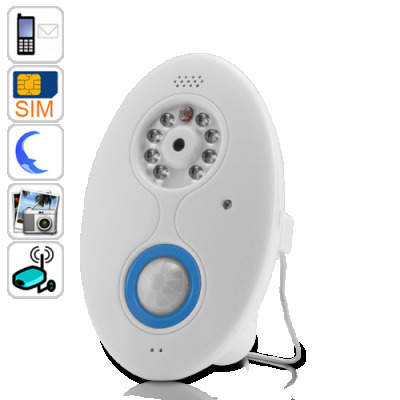 What’s also great about this GSM remote security camera, is the on board MIC and speaker which means that you can also call and warn intruders that they have been caught. This GSM security remote camera comes sturdy built, which is made up of strong molded ABS plastic, high tech internal components, 8 LED's with an (IR) infrared sensor, a motion detection sensor along with onboard MIC and speaker. With its practical functions, fashionable appearance and a bright design, this is the perfect security option for your security needs. Click "Add to Cart" now and we'll ship you a sample to see how amazing this intelligent security GSM camera really is. The DC14 GSM security camera is brought to you by the number one wholesalers in consumer electronics, Chinavasion.